Is it time for a new BMX frame? Are you looking for something shiny? What about something that will hold up to whatever you throw at it whether it’s park, street or dirt? Our friends at Radio Bikes dropped one of their Siren frames on our front door step to take a closer look at just what makes the frame so special. We figured it would be a good idea to give you guys a closer look, too! So let’s get into this one! Let’s start out from the beginning! The Radio Bikes Siren BMX frame is made from seamless 4130 chromoly tubing with a 75-degree head tube angle, 71-degree seat tube angle, 11.6″ bottom bracket height, 8.3″ standover height and a 13.2″ chain stay length. You can find features like a CNC machined and heat-treated integrated head tube, gussets on the top and down tubes, butted top, down and seat tubes, a MID bottom bracket, an integrated seat post clamp, removable brake mounts on the seat tube with removable guides and a drilled head tube for gyro tabs, the seat stay bridges feature cut outs for a unique look while saving a few ounces, plenty of tire clearance for 2.40″ tires and thick CNC machined 14mm drop outs with extra machining for a unique look. The Siren frame features a MID bottom bracket and extra machining on the bridges for a unique look and plenty of tire clearance for a 2.40″ tire in the back. You can find gussets on the top and down tubes for plenty of strength. There is an integrated seat post clamp that is cut at an angle for a clean look. The Siren frame features removable brake mounts on the seat stays with removable guides and a head tube that has drilled holes for gyro tabs. The 14mm dropouts on the frame are nice and thick with some extra CNC machining to give them a unique look and to shed a few ounces in low stress points. 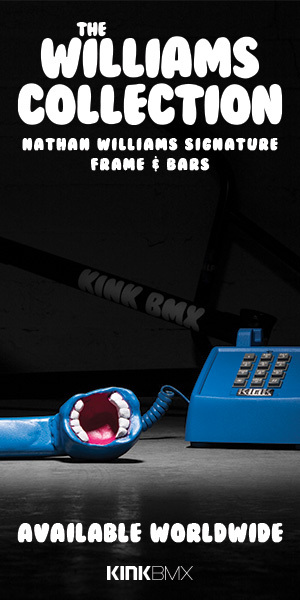 The Siren frame is available in top tube lengths of 20.5″ and 21″ with colors of chrome, black and translucent blue through all BMX shops and mail-orders that carry Radio Bikes worldwide! Have your local shop here in the United States get ahold of QBMX to get you one ordered up today. Live outside of the U.S? Here’s their full list of Distributors. What do you think? Do you have any questions? Let us know in the comments!